There are times when it’s easiest to clear a clogged sewer drain from inside your home. For example, if the clog is far from your main drain cleanout, or if there’s a drain elbow or other transition that makes it difficult for your sewer jetter to reach from your main drain cleanout to the problem area. When you use an indoor cleanout that’s upstream of the clog the sewer jetter is working with gravity and pulling downhill. This can be a big advantage if you’re using a smaller, electric pressure washer for the job. Use a sewer jetter only in a well-ventilated area. Wear eye protection and fluid-resistant work gloves. Always operate a gas-powered pressure washer outside. If the hose from the gas-powered pressure washer to the trigger gun isn’t long enough to reach the indoor cleanout, add a high-pressure extension hose between the pressure washer and the trigger gun. To avoid water damage to floors, check all hose and trigger gun connections for leaks outdoors with the pressure washer running before you bring any water lines inside. Start by finding a suitable drain opening that’s upstream from the clog, such as an indoor cleanout or an inlet under a sink. If the cleanout is over a floor or cabinetry, protect the area underneath with a bucket and plenty of towels before you open the drain to avoid water damage. For easier handling, partially unroll and insert the sewer jetter hose in smaller increments as needed. It’s recommended that you unroll and roll up the hose in an area where it will be easy to clean after use such as a bathtub, shower stall or sink. Feed the jet nozzle into the drain opening. Guide the jetter hose as far as possible into the opening before you squeeze the spray wand trigger to release the flow of water. Squeeze the trigger as you feed in the hose. You’ll feel a firm tug as the jetter nozzle starts to pull itself into the drain. Work to feed the hose as efficiently as you can, watching for any fluid that might splash out through the cleanout opening. Continue to feed in the hose as you squeeze the spray wand trigger until the clog clears. Once you’ve cleared the primary clog, you can scrub the sides of the drain pipes in the problem area to reduce the need for future cleaning. Continue feeding the sewer jetter hose into the opening, pulling back about halfway every few feet before you continue moving forward. After you finish cleaning the drain, pull the sewer jetter hose out, using care to release the spray wand trigger and stop the flow of water before the nozzle reaches the opening. 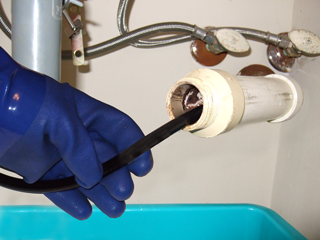 Coil the sewer jetter hose in a bathtub, shower stall or large sink. Rinse the coiled hose with warm water and gently shake dry. Then hang the coiled sewer jetter hose in your garage or shed, away from direct sunlight, children and pets. Visit the Clog Hog website for more drain cleaning tips and information.